I will be standing as an Independent pro-democracy candidate in the state electorate of Mount Coot-tha in the forthcoming state elections. In part, my purpose in standing is to raise critical policy issues, which I believe will otherwise not be drawn to the attention of the Queensland public. The evidence clearly shows that privatisation has gravely harmed the public interest and as a consequence, has been overwhelmingly opposed by the Australian public, including the Queensland public, for years. Yet, most Australian governments, including your own, have persisted in imposing privatisation without any popular support and without any electoral mandate. The list of privatisations, which comes to my mind, includes Energex, Ergon, the Golden Casket, the Mackay and Cairns airports, the Dalrymple Bay Coal loader and numerous tracts of valuable publicly owned land. Indeed, the only privatisation that was raised in an election campaign of which I am aware, is that of the then named State Government Insurance Office (SGIO), now named Suncorp. 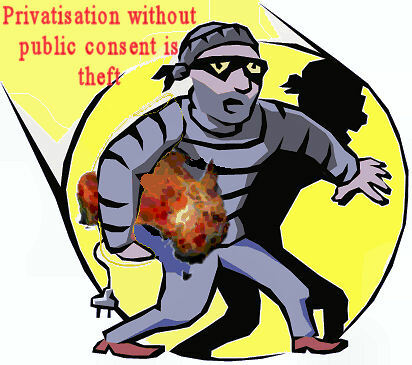 Former Premier Peter Beattie promised during the 1998 election campaign not to fully privatise the half privatised SGIO, but, upon winning office, promptly broke that promise. Last year we witnessed, in neighbouring NSW the appalling spectacle of the NSW corporate sector including Rupert Murdoch's Australian newspaper, clamouring for the privatisation of NSW's electricity generators, even though that policy was never put to the NSW public in the previous state elections of 2007, had been explicitly rejected in the 1999 elections and was opposed by at least 79% of the NSW public. In spite of the widespread public opposition, and in defiance of a vote 702 to 107 against privatisation at the NSW state Labor Party conference of May 2008, Morris Iemma's Government proceeded to ram through the privatisation legislation anyway. Thankfully for the people of NSW, the legislation was blocked with the votes of the Liberal/National Party Opposition, Greens and Independents. Premier Anna Bligh, I was disturbed to read that your Government also gave its support for the privatisation of NSW's electricity generators, in spite of your own reported personal stance against the privatisation of Queensland's electricity generators in 2006. Given this history, it seems to me that the Queensland public have good reason to fear that, upon re-election, your Government may proceed to sell of yet more of their assets, including Queensland Railways, electricity generators, more airports, the water grid, public buildings, public land, etc. The reason I write this letter is to seek your firm assurance that if you do intend to privatise any of these assets that you state your intention to do so to the public before the forthcoming elections, or, alternatively, that you will put any planned privatisations to the public at referenda. To Q and A: Why wan't my video question put to Anna Bligh? This was posted to Q and A in response to their failure to put my video question to Anna Bligh on tonight's program. See also 9:36PM on Q and A: Anna Bligh to be questioned on privatisation. Was Virginia (Triole - spelling? ), your temporary replacement for tonight's program, not properly instructed on how to compere Q and A? ... or was it the Q and A management's decision not to put one video question, nor one posted on-line question to any of the four panellists? The only questions put to the panel were from the studio audience, none of which seemed to pose any challenge to any member of the panel. A friend who watched Q and A to see my question put to Anna Bligh fell asleep for a while, so bored was she with the questions put and the self-indulgent responses from the panel. I went to lot of trouble to have my question to Anna Bligh filmed, edited and uploaded. I had thought that my question about why she did not ask Queenslanders at the March 2009 elections for a mandate to privatise so many of their publicly owned assets was precisely the sort of question that should be put to members of Q and A panels and precisely what Q and A's domestic audience want to see. Finally, could you please tell me how questions are selected to be put to panel members? It was quite uplifting, before tonight's episode, to see my video question only fourth in the queue. Are they voted upon by Q and A viewers or are they selected by you or other staff at Q and A?